ISTEC 9200 Series are positive displacement type meters with a mechanical totalizer. These meters are very accurate (±1%) over a wide flow range. The positive displacement design in not affected by viscosity or density and they can be mounted in either horizontal or vertical positions. 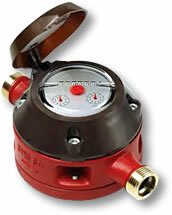 The meters are also available with an optional dry contact pulse output and ANSI or DIN flanges. For supply – return applications they can be ordered as a matched pair (±0.5% accuracy) built for differential measurement.